AN emergency alert has been issued for the Logan River amid predictions it could hit 13.9m, as the bureau warns similiar flooding levels to 2011 may occur in southeast Queensland today. 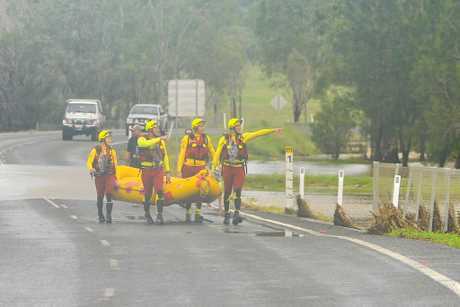 Water levels continue to rise, causing flash flooding in Beaudesert and surrounds, according to QFES. A flood alert was also issued at 12am for the Logan River at Beaudesert, while an earlier alert at 11.06pm Thursday warned of rising levels on the tributaries of the lower Brisbane River, including the Bremer River and Lockyer, Laidley and Warrill Creeks. It warned major flood levels may exceed 8.12 metres at Amberley, similar to the 2011 flood in this area. Major flood levels may also reach 8.95 metres at Laidley, similar to the 2013 flood in this area. Category four winds and associated rain that blasted the northern coastline have turned towards the inland and the south of the state where almost almost 500mm fell in 24 hours near the Gold Coast. Springbrook in the Gold Coast hinterland was the most heavily-drenched on Thursdaay - 486 millimetres until dusk - while the Redlands was expecting a full day total of about 400mm. Brisbane and surrounding areas copped, 226 millimetres, more than twice a month's worth of March rainfall on Thursday. Across the state's central and southern regions, 58 swift water rescues were performed by authorities, who are pleading with people to stay indoors. The wild weather has been forecast to intensify overnight. A flood warning has been issued by Scenic Rim Regional Council for residents of Beaudesert. The Logan River is expected to peak causing major flooding at approximately 7am on Friday. River level rises above the minor flood level on the Brisbane River at Brisbane City are not expected at this stage. More than 1000 schools will remain closed today after ex-Cyclone Debbie unleashed a deluge that caught authorities by surprise, causing flash flooding and forcing widespread closure of businesses. The southeast was plunged into chaos when the State Government made the "unprecedented late call" at 7.20am yesterday to shut schools, with people warned to stay home and businesses urged to close by midday. Brisbane's CBD was a virtual ghost town by the afternoon and peak hour on the roads was reversed. Parts of Brisbane received more than 200mm of rain and more than 660mm was dumped on Springbrook in the Gold Coast hinterland. Last night, destructive wind gusts of up to 115km/h were being felt around Brisbane, with winds on the Gold Coast reaching 125km/h. A helicopter pilot was also treated for minor injuries after wild winds caused the chopper to crash near Toowoomba about 6pm. Power was cut to 25,000 Brisbane homes, 34,000 on the Sunshine Coast, more than 4000 in Logan and nearly 2000 on the Gold Coast last night. As the state's battered north assessed the damage from this week's Category 4 storm, emergency crews raced to rescue people in the inundated Mackay region and residents dealt with flooded homes in Gladstone and Bundaberg. In the southeast, some flood-prone Brisbane homes were left waterlogged and thousands of properties lost power. Emergency crews were kept busy with more than 1500 calls for help and 50 swiftwater rescues. One of the rescues occurred when a group were forced to huddle together for safety on top of a car on Beaudesert-Nerang Rd at Tabragalba. They were among 20 people - 14 adults, five children and an infant - who became stranded in the area about 2pm. It was the largest group involved in a single swiftwater rescue effort during yesterday's storm. A major operation was mounted to save them after they drove along the flooded causeway. Queensland Fire and Emergency Service crews, the swiftwater rescue team and SES joined forces to bring them safely back to land. It coincided with another rescue further north, on the Sunshine Coast, where a local family had to be saved from rising floodwaters which trapped them inside their house at Tanawha. Four children and their mother were taken from the house in a swiftwater rescue at Sippy Creek Road. More than 100 calls were made to Queensland Fire and Emergency Services for a swiftwater rescue, 60 in southeast Queensland alone. The SES were also called to about 130 incidents on the coast. Coastal areas were last night warned to expect wind gusts of 120km/h, further rainfall of up to 500mm and a possible storm surge. 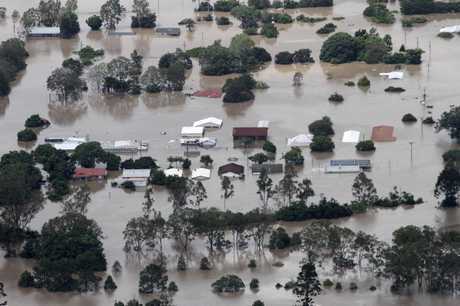 Dam levels were being closely monitored in case releases were needed to prevent the kind of catastrophic build-up that condemned Brisbane to mass flooding in 2011. Water Minister Mark Bailey said Wivenhoe Dam was at 69 per cent capacity, with water releases required if levels reach 90 per cent. "SEQ Water have got all their people working on this, modelling the data as it comes in. We are watching it very closely," Mr Bailey said. Weather bureau senior forecaster Matthew Bass said the storm was expected to clear the southeast coastline about 3am today. "We're seeing flash flooding across the southeast, and these heavy rainfall periods that are occurring will lead to further flash flooding," Mr Bass said. Brisbane residents scrambled for sand bags to protect their properties yesterday, with wait times of more than an hour at some council depots. At the Newmarket depot, there were delays of up to two hours as people queued for supplies. More than 40,000 sand bags were filled in advance and council machines were busy filling a further 4000 an hour to keep up with the huge demand. 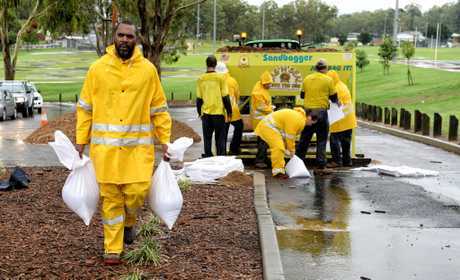 Evacuation centres were opened in areas including Ipswich, Redlands, the Gold Coast, Sunshine Coast and Moreton Bay. Flash flooding revived horror memories yesterday for victims of the 2011 floods. Rosalie's Salt cafe owner Mario Perna couldn't shake thoughts of the past as water lapped at the entrance yesterday morning. "I'm thinking about 2011 and how high it's going to come," Mr Perna said. The business suffered thousands of dollars worth of damage in 2011 when 2m of water swamped the Nash St eatery. Rocklea resident Yenju Chen came home from work at midday to find 10cm of floodwater in her ground-level apartment. "I've only just moved in here and I didn't know it would be raining like this today until I received the message from the government," Ms Chen said. "Once I came back there was water everywhere inside. I've been cleaning all morning and I think I'll be cleaning all afternoon." After he had prepared his home as best he could, Martin Kornaus took his jetski through floodwaters in Rocklea's Corella St. But the dirty brown water brought back bad memories of 2011, when the houses disappeared underwater completely. "There's water damage, but we've been pretty good. It's a revisit of the post-traumatic stress from 2011." "We've lifted everything of value off the floor and killed the power," he said. "They are just the precautions we have to take to protect our valuable items. If the water just keeps on coming up we are in a lot of trouble." At Ashgrove, residents were on high alert after flooding from Breakfast Creek began before 9am. "It's incredible," said resident of three years, Rueben Garlick. "This would probably be the worst (I have seen the creek)." At 10am inbound lanes that would normally be clogged with morning traffic were empty, with outbound lanes full instead, as motorists tried to make it home before the deluge. Office workers leaving early filled outbound trains in the morning, leaving platforms abandoned in the afternoon. Elective surgery and outpatient appointments at seven Queensland hospitals were cancelled and "non- essential" public servants were sent home. Driver ignores flooded roads message : It seems the 'If it's flooded, forget it' message only applies to some motorists. Premier Annastacia Palaszczuk and Police Commissioner Ian Stewart during a press conference yesterday morning. As well as schools, universities and more than 800 childcare centres were closed. 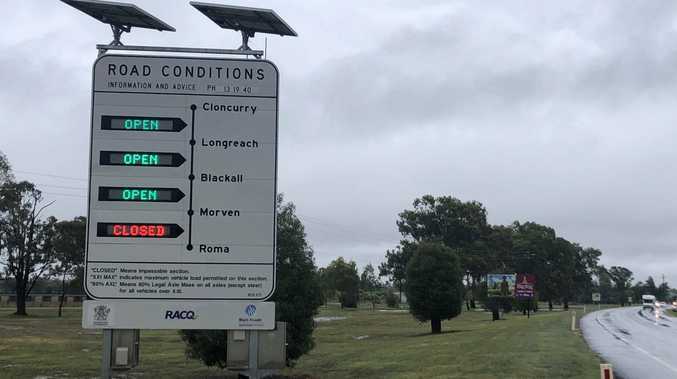 Despite the Bureau of Meteorology forecasting a return to sunny weather this morning and only a "slight chance of a shower", Premier Annastacia Palaszczuk said state and private schools from Agnes Water to NSW would remain closed. "This is a severe weather event. The safest place for families to be over the next 24 hours is in their homes," Ms Palaszczuk said. A spokesman for the Premier last night said: "Following such a significant weather event, it will be necessary to assess safety of schools for fallen debris, broken glass, electrical faults and other hazards. "Under the circumstances, this will not be able to be done by the morning." Queensland Teachers' Union president Kevin Bates backed the decision to call off school for another day saying it was "much better to be told" ahead of time rather than get the message out at the last minute again.